Cleaning up our focus can create perfect balance in our body and mind. I use the tuning forks to activate and center the mind. Then the Angels and Angelic Reiki comes through for you, and together, we will do all we can for you, on this energetic level. Each instrument has a purpose. They work well in combination with the reiki. 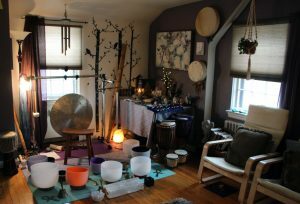 I use Crystal and Metal Bowls, Gongs, a vast array of Tuning Forks, Drums, Rattles, Tingsha bells, Rain Sticks, and many Chimes. I use my intuition to work on each person, pet, property and group. I pair with their purpose to create a healing effect that is unique. I use traditional reiki symbols, sacred geometry and the love and wisdom of God(the universe/Spirit/the electrons), whatever you call it. It is a pure energy that I felt the first time I wanted to really make a difference in the world. It is as real as love is good. It feels like all that is love and life is present. It blesses me to serve. I have a guided meditation that assists in really receiving this love and wisdom. I ask us to bring our focus to the center of the forehead. This creates higher potential, because we are focusing on choosing new thoughts. The path to new beginnings is now brightly lit. I remind us to breathe deeply often throughout the meditation because it is essential to train our body and mind to work as a team for our higher good continually. I ask us to breathe in peace and breathe out peace, because we don’t have to assume that we need to expel yuck. We could just be improving our state of wellbeing by adding more into our lives. Next we focus on the heart. We send it love. This teaching us to love ourselves. This is also how to send love to all that is life. Appreciation of others and the self are the exact perspective of God. Next we focus on the feet. Feel the earth energy traveling up them. The earth nurtures us always. Next focus on the head. This is our connection to God. God is the lover of our souls. Feel the deep love and respect for all. This is true. Now feel your aura. It is like a nurturing womb. It is always surrounding us with peace. It is always filling every cell with blissful vibrancy. It is love. It is life. It is you and also a gift for you. Notice how well it serves you. The ever expanding cosmos is our playground. We are here now. We are home. Breathe in peace. Breathe out peace. I also speak affirming words into our meditation. Affirmations encourage us. They lavishly nurture our minds. It’s important to assure ourselves. Encouragement and hope never cease to uplift us. This is why we have intuition. We heal ourselves and others as we go, in the most beautiful manner. All is well. It will always improve. We are each cherished. We are all God’s favorite is my favorite thought to tell the ego. It can play with that forever. I am attuned by Spirit. I am forgiven. I forgive. I am higher potential forever. I am experiencing new beginnings of more and more bliss. Bring your focus to the center of your forehead. We center the mind and welcome a peaceful state of consciousness. New thoughts of wisdom are given. The path to new beginnings is brightly lit. Our higher potential brings us to new heights. Now feel your heart. Send it love. We have learned so much. We share our wisdom here, creating love expanded. Focus on your feet. The earth nurtures us always. Feel the energy of love and support travel up your feet and through your head. You are a fountain of blessings. Focus on your head. This our connection to God, the cosmos, the electrons, your Spirit. God is the lover of our souls. Feel the presence of deep love and respect for all. We are cherished. This is true. Now feel your aura. It’s like a nurturing womb. It surrounds us with peace. It blesses every cell with blissful health and vibrancy. It is love. It is life. It is you and also a gift for you. Notice how well it serves you.